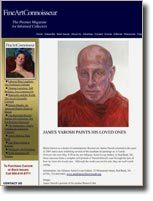 Established in 1996, the James Yarosh Associates Fine Art Gallery was founded upon and remains loyal to its vision: to represent fine art for art's sake and to curate gallery collections and thoughtfully present art with an artist's eye and understanding. Gallery owner James Yarosh draws upon his knowledge developed as an artist and published interior design devotee, in addition to his industry experience and variety of solid relationships with international artists developed since 1985, to provide complete fine art services for residential and corporate projects. James Yarosh Associates Fine Art Gallery provides collectors, interior designers, and trade clients with fine art selections appropriate to a multitude of tastes and interests. The gallery has received critical acclaim on a national level for presenting Russian fine art collections and recognizing significant art movements early on. Drawing upon both international and regional resources, James Yarosh Associates Fine Art Gallery aspires to represent a variety of artistic voices of our times by showcasing the works of both new and established, museum-recognized, artists of merit. The gallery aims to offer the highest quality of art while maintaining accessibility at the gallery level. James's trademark ability is integrating art and design, resulting in visual excitement while allowing both disciplines to still stand on their own merits. To satisfy his passion for art and to extend his art education and experience, James travels abroad extensively regularly to study art in the world's greatest museums. He also pursues continued education through the Bridgeview Fine Art Academy, including drawing at the Metropolitan Museum of Art in New York City. James Yarosh Associates Fine Art Gallery highlights for 2017 include the U.S. debut event of new fabric and wallpaper by Hermes and Dedar; the art of textile design with Clarence House's art director Yoshida Kazumi, featuring Kazumi's original drawings and paintings of some of the fabric house's most iconic offerings; and an artist meet and greet with Iliya Mirochink for a from-the-artist's-studio event, including Mirochink recent works inspired from his travels in Austria. In fall, 2017, James Yarosh Associates Fine Art Gallery will partner with Monmouth University to curate a one-person exhibit of Sheba Sharrow as a museum presentation of the artist's work. 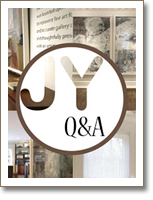 In 2016, the gallery's 20th anniversary, James re-examined the idea of gallery openings and began hosting seasonal fine-art- and design-themed salon events. The limited space events become invitational gallery dinner parties that foster more intimate conversations and greater understandings of the arts and what inspires those who create it. Anyone interested in attending a James Yarosh Gallery Salon evening should email the gallery their contacts to be included. James has partaken in various charity designer show houses, including Kips Bay, Mansion in May, Twin Maples, and Stately Homes by the Sea. He was awarded the second-floor atrium space at the Blairsden Mansion in Peapack-Gladstone, New Jersey to present "An Art Collector's Sanctuary" as part of the 2014 Mansion in May's designer show house. In 2012, James served as a fine art judge at the 42nd annual Monmouth Festival of the Arts, an event he participated in as an artist 25 years ago when beginning his career. As a solo window presentation at the Art Alliance of Red Bank, New Jersey, James showcased a series of his own oil paintings entitled "A Family Portrait" in May, 2011. James also served as a competition judge and presided as a guest judge at the nationally recognized Bayonet Farm Art and Music Festival's plein air competitions, alongside his invited guests, Peter Trippi, editor of Fine Art Connoisseur magazine, and, most recently, Stephen Doherty, editor of Plein Air Magazine. 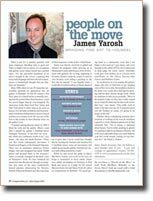 James Yarosh Associates Fine Art Gallery was chosen as top pick for Wainscot's Monmouth Health and Life magazine's Best Gallery Award in both 2011 and 2012. 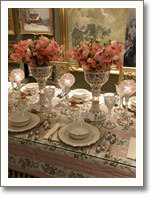 In 2010, the gallery received honor with an A-list Gallery Award by New Jersey Life magazine. 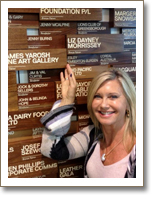 James has also proudly achieved In-Circle status for the gallery due to his continued support for the Olivia Newton-John Cancer and Wellness Center, earning a near-silver contribution level and gallery recognition paver. Incorporating an artist's eye and fine art as the basis of interior design inspiration has led to James's publication in New York Spaces magazine, multiple design features in DesignNJ magazine, and other publication features. In addition, James's design experiences for residential projects encompassing over 20,000 square feet earned him a guest appearance on HGTV. James was also featured in the winter, 2008 edition of the Art and Antiques Collector's Sourcebook in an article titled, "Imperial Eye," written about his personal and gallery fine art collections and his involvement with notable Soviet-era and Russian art. In the fall of 2012, James Yarosh Associates Fine Art Gallery moved to its current home at the former site of the 1917 firehouse loft on Main Street, next to the old white church in Historic Holmdel Village. The new location underwent a full interior design renovation to provide not only a thoughtful setting to display art and gallery openings, but also a sanctuary for kindred spirits of the arts to visit with the welcoming presence and interest of an artist's home. Also in 2012, James Yarosh Associates Fine Art Gallery premiered a signature collection of carved, handcrafted frames that provide historically-referenced samples representative of the finest detailing and artistry of true custom framing. Framing can be scheduled with James by appointment to create original designs and at the Frame of Mind Gallery in Holmdel, New Jersey, located adjacent to James Yarosh Associates Fine Art Gallery. James Yarosh Associates Fine Art Gallery, located at 45 East Main Street, 2nd floor loft space in Holmdel, New Jersey, is open Saturdays, 12 to 4 p.m. and by appointment weekdays and evenings. James extends at-location consultations to give clients guidance with framing, placing, and displaying original fine art. For further information, please contact James at 732-993-5278 or via email at jamesyarosh@yahoo.com, where you are welcome to register for e-card gallery show announcements or to inquire about scheduling an appointment to visit the gallery or to receive an in-home consultation. The above services and presentations illustrate the essential benefits of recognizing and incorporating fine art in the home as part of the everyday living experience. 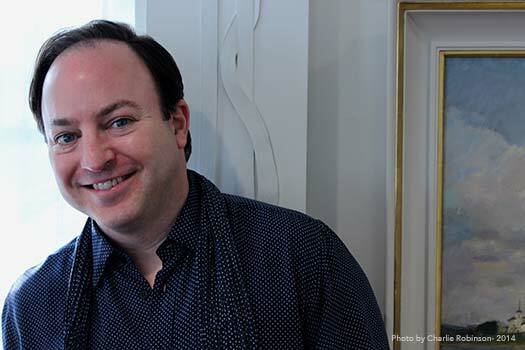 Gallery owner James Yarosh credits his travels to the world's greatest museum, as well as his visits to artist homes and studios as his greatest idea inspirations and sources of support of his mantra of living with art. A collector of 20th-century Russian art is so intrigued he makes it his business. James Yarosh can trace the change in his artistic direction to the day in 1994 when he glimpsed a crimson-hued abstract painting titled “Angel” by Russian artist Andrey Skripka. Yarosh had immersed himself in art his entire life and was just starting a career as a painter – a struggling painter, perhaps, but a painter nonetheless. Then came “Angel.” The work knocked Yarosh for a loop. Like most Western artists, dealers and collectors, he knew little about the vast body of work produced throughout the Soviet republics from the early 1930s to the early 1990s. Gallery owner carries his love of beauty into his seaside home. 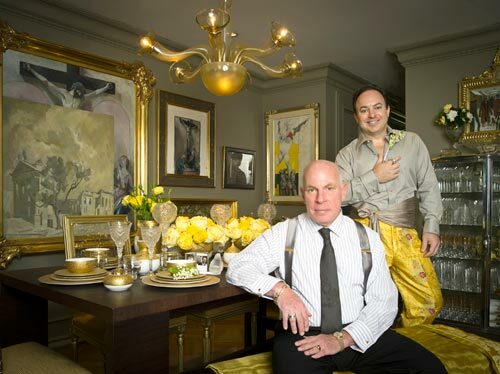 JAMES YAROSH BELIEVES HOMES SHOULD BE "SELF-PORTRAITS." That's an apt analogy from an interior designer who is also immersed in the world of fine art. The owner of James Yarosh Fine Arts & Design Gallery in Holmdel, Yarosh says when an art collector also requests his design services, it's the start of a very special relationship. What is art? It's a timeless question with so many responses. Deciding what is great art? That's a tougher one to answer. It's no surprise that gallery owner James Yarosh has a perfect reply: "It's the successful translation of an artists thought to its viewer, a painting that transcends language and time and still communicate a fundamental thought that can illustrate our humanity." Better known as a dealer of contemporary Russian art, James Yarosh returned to the easel in 2007 and is now exhibiting several of the resultant oil paintings as A Family Portrait. On view May 4-29 at the Art Alliance Artist Co-op Gallery in Red Bank, NJ, these canvases form a complex self-portrait of Yarosh himself, seen through the lens of how he views his loved ones. Although the works are not for sale, they are well worth seeing. 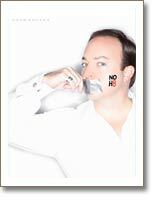 2012- Gallery owner James Yarosh lending his face to Adam Bouska's NOH8 photography campaign. James Yarosh Associates would like to thank our gallery friends and clients for their generous sponsorship and invite others to join us towards greater gallery support of the Olivia Newton-John Cancer & Wellness Center charity.